F. Prip was Folmer Trolle Prip, born 6 March 1892 in Kobenhavn, Danmark (Copenhagen, Denmark). He immigrated to the U. S. in 1914 and lived at 128 8th Ave., New York City, in 1917 when he registered for the World War I draft. 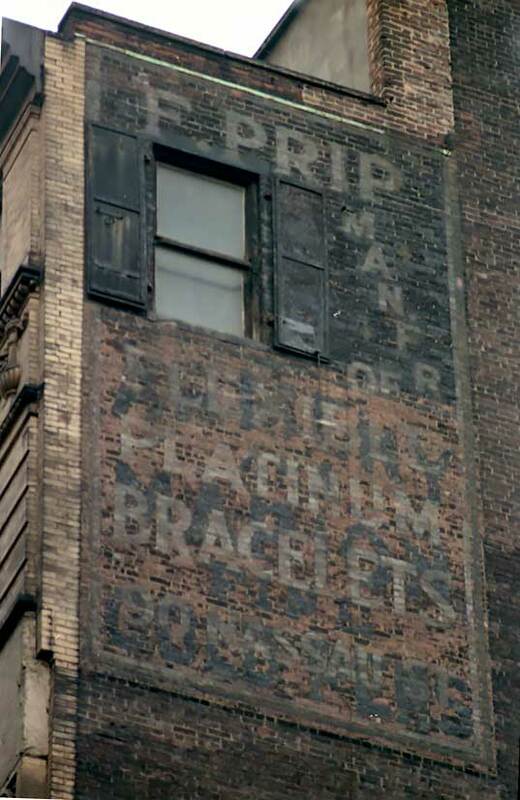 Folmer Prip jewelery at 82 Nassau St. was listed in the New York telephone directory in 1920. In 1922 "Folmer Prip, manufacturer of flexible platinum bracelets, notified the trade last week that he has moved his office and factory from 82 Nassau St. to larger quarters at 90 Nassau St." (The Jewelers' Circular, 24 May 1922, pg. 97). In Polk's 1925 New York City Directory Prip was described as "Specializing in Flexible Platinum Bracelets" at 90 Nassau St., while he made his home in Yonkers, N. Y. He was recorded in the 1925 New York State Census, age 32, born Denmark, living at 63 Kingston Ave., Yonkers. In 1928 Prip moved his business from Nassau St. to 76 West 46th Street, in the city's "diamond district." The business survived until the early 1930s. The website www.academia.edu/30817525/Restless_Dane offers the following, "Folmer Trolle Prip (b. 1892) was the son of Danish silversmiths whose family operated a souvenir spoon factory in Copenhagen. In 1914, at the age of 22, soon after he completed his apprenticeship, Prip arrived in New York and found work in the silver industry. By 1925, Folmer Prip had his own jewelry establishment in Manhattan, and had married an Amerian, the former Marian Evelyn Cherry, in 1921. John Axel Prip, his only child, was born in 1922, and the family resided in Yonkers, New York. The Great Depression prevented Folmer Prip's jewelry business from prospering, and in 1933, the Prips sailed to Copenhagen, where his father returned to the family flatware firm. ..." A great deal more about Folmer Prip's son, John Axel Prip (1922-2009), is included at this source.